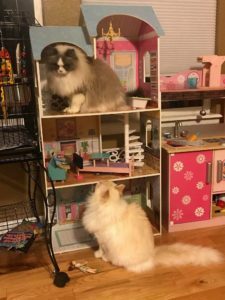 Lexes Dolls has the Ragdoll kitten/cat you’ve been looking for… We Have Them. Ragdolls are special cats for special people. Today’s Ragdoll cat was developed in the 1960’s, from the combination of longhaired cats in Riverside, California by a woman named Ann Baker. Ragdoll cats are strictly indoor cats that love and depend on their owners. It is extremely important that the Ragdoll cat remain inside, for they are so docile and innocent that they possess a non – fighting instinct tending to not defend themselves. I compare the Ragdoll’s personality to that of a loyal canine. Ragdoll cats are “laid back”, friendly, and characteristically warm. Ragdoll cats crave love and attention from their owners making them perfect lap cats. Ragdolls have deep blue eyes that are oval and large. are relatively easy to groom. Ragdoll cats are large sized cats that can weigh 10 to 20 pounds, and may take up to 3-4 years for them to reach their full size. Male Ragdoll cats tend to be heavier then female Ragdoll cats. Spayed and neutered Ragdoll cats grow to be larger than non sterilized Ragdoll cats. 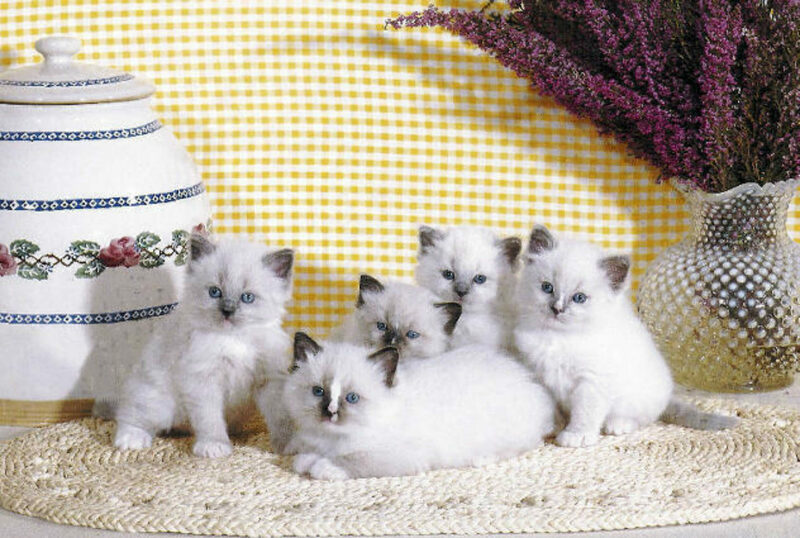 Sterilized Ragdoll cats also have much plusher fur, and make much better family pets than non sterilized Ragdoll cats. Your special Ragdoll kitten or cat will have an excellent calm natured temperament, a relatively quiet voice, and may even go limp when held. Ragdoll cats are very smart and talented making them easy to train and very entertaining. The docile Ragdoll cat is easy to introduce into a multi-pet household, wonderful with children, and wonderful companions for seniors too. 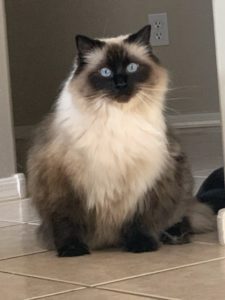 You will often find your Ragdoll cat greeting guests at the door, and nearly always following all members of the family around your house. Ragdolls make perfect pets for nearly every household and give an overall impression of power and elegance.